A Blog about what we are working on in the Dolman & Taylor workshop. We put thought and care into the placement of a pattern on the curtains and blinds we make in the workshop. 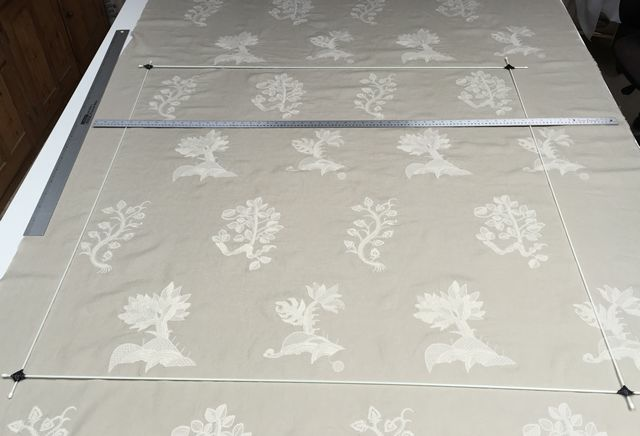 Today we have a Mark Alexander embroidered linen on the table that we are making into a Roman Blind. The pattern on this fabric is proving to be a little trickier than normal because every option involves a compromise. We thought it is a good teaching example, so we made the following video for our Sew-helpful.com website (Where we teach you how to make your own curtains & blinds). It shows the thought process we went through in deciding where to place the pattern and what we considered. Placing a Pattern on a Blind from Sew-Helpful.com on Vimeo. A workshop in the Cotswolds specialising in making beautiful curtains, blinds & soft furnishings in fabrics from smaller independent fabric designers. Our teaching website where you can learn how to make your own soft furnishings the Dolman & Taylor way.